Covered Calls are a conservative income strategy and as such, provide limited protection against a fall in the underlying share price. 1. Look for either a range bound market or a bullish trending market where you anticipate a steady increase in the price of the underlying stock. 2. Examine the options connected with the stock to ensure there is enough liquidity. 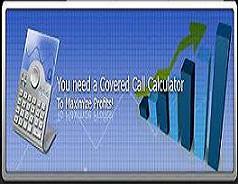 3. Review premiums and strike prices for call options no more than 45 days to expiry. 4. Check implied volatility on these options to ascertain whether they are overpriced or undervalued. Since you're going ot sell option contracts, the best result will be expensive options. 5. Examine a chart of the underlying stock for the past year to decide where the stock currently is in relation to its overall price cycle. 6. Choose an option strike price which is higher than the current market price to sell against the shares you will buy and then calculate the maximum potential profit. This will be the credit you receive from selling the short call options, plus the difference between the current market price of the stock at the time you enter the trade and the strike price of the call options. Unlimited Risk should the underlying stock price fall Limited Reward being the maximum potential profit you have calculated Breakeven, being the level to which the underlying stock can fall before you start to lose money. This will be the premium from the short call deducted from the current price of the stock when you enter the trade. 8. Create a risk graph of the most promising looking alternative. Note the unlimited risk below the breakeven. 9. Make a note of the trade setup and reasons for it in your trading journal before you execute it. This will help minimize the possibility of mistakes, as well as provide a reminder of how you were thinking at the time. 10. Decide on an exit plan before you enter the trade. Part of the plan involves being prepared to sell the stock at the strike price of the options you will sell, if the calls are assigned. 11. Execute the trade with your broker. Do it as a "limit order" so as to minimize the overall cost of the trade. 12. Watch the underlying market closely from here on. Be prepared to make a decision whether to sell the stock once it reaches the breakeven point, or adjust the position back to a delta neutral one to increase profit potential. Whether you choose to follow the above covered call steps or create your own list, we cannot over-estimate the importance of having a consistent approach, for trading success. We have found one of the best services for scanning the markets and finding eligible stocks, is the Market Club Trade Triangle Scanning Service. You can take a full featured test drive of their services for only $8.95 for the first month. You get a whole lot more than this, but for Covered Call picks, this is such good value.